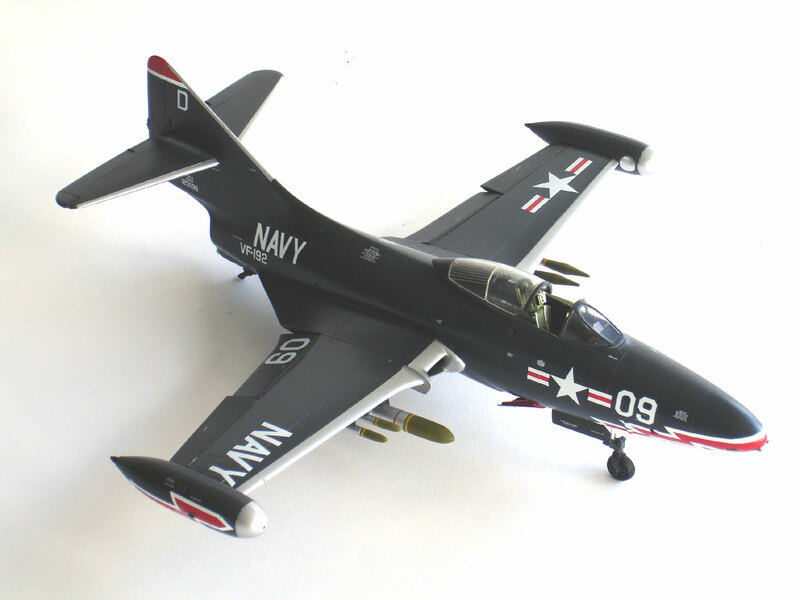 For finishing the Panther a gloss blue scheme was selected. For the blue I used the basic blue color of Xtracolor X121 Gloss Sea Blue. To add some life to the model, a bit a white was added and the moving surfaces sprayed in a slightly different sheen. 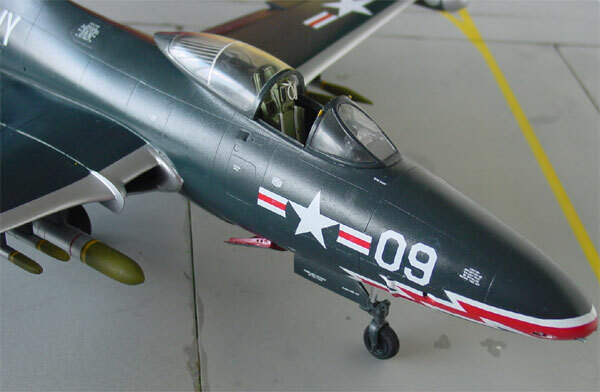 Nice decals are provided in the kit for 3 versions. 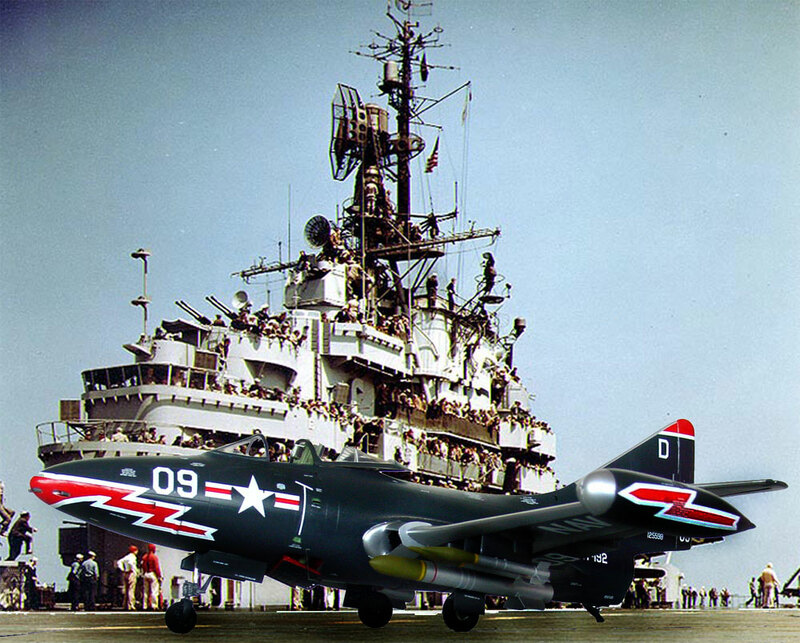 But I opted for a more spectacular scheme with red-white edged arrows on the nose and tip tanks. 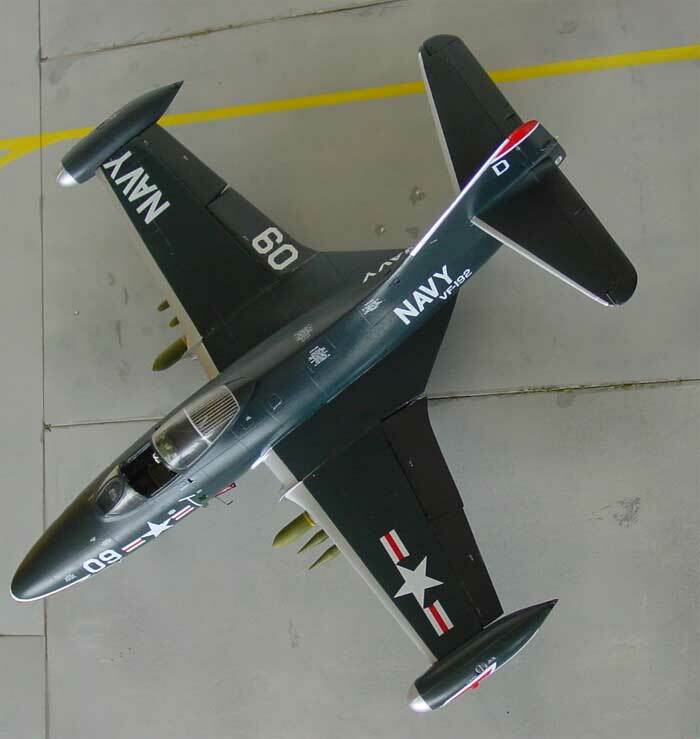 It represents a US NAVY F9F-5 Panther of VF 781. 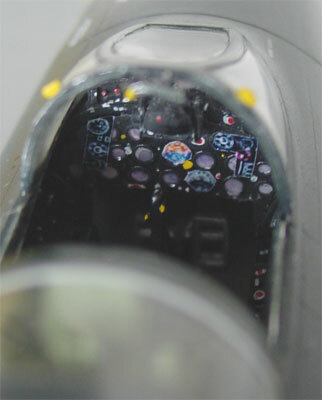 A pattern was made enlarging a 1/48 decal to 1/32 size for the arrows. 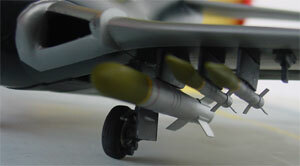 Next the arrow scheme was achieved with masking with fine Tamiya tape the arrows and spraying the white and red areas. Also, white decal strip was used for the borders and trimmed with a new sharp blade. 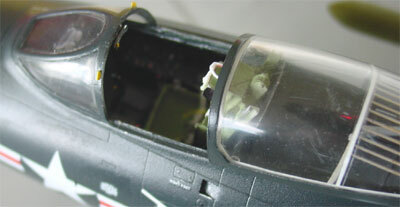 It takes quite some effort to get right especially on the curved nose of the Panther model. 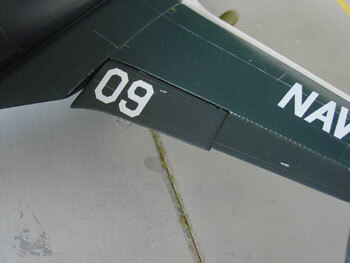 I could not find the correct VF 781 numbers so kit supplied decal numbers were put on, only an expert can tell. 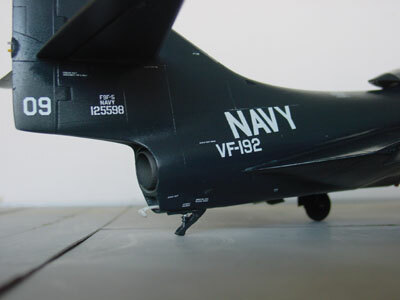 The very narrow white line on the canopy of the sealer was achieved with fine white decal strip trimmed at correct lengths. 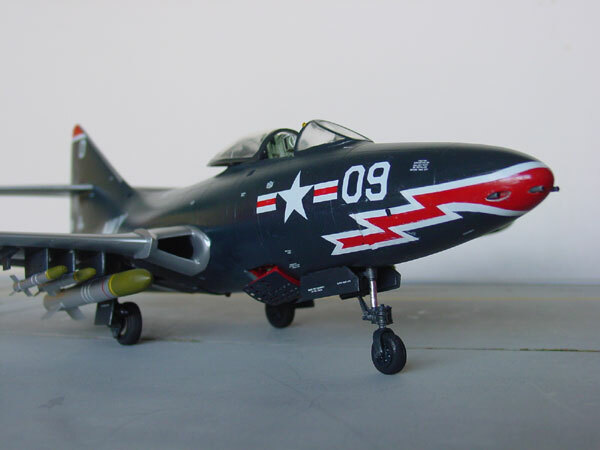 The Panther model got its various decals such as stencilling using the Fisher decals which are excellent. However, the instructions on where to put the various stencils are not clear. You get far more stencils than shown on the instructions. Finally, I added just a little wetahering on the model, limited to some hinge lines with a slight black wash.
After cleaning up , the overall model got a sprayed on coat of Johnson Future. Next, the completed and painted stores were added. 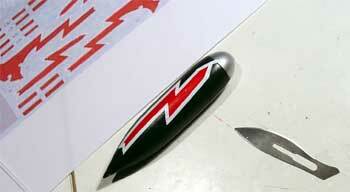 The striping was made with various decals strips in yellow and red. 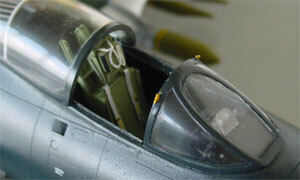 Also, the nose gun barrels were added made from some metal paperclip wire. 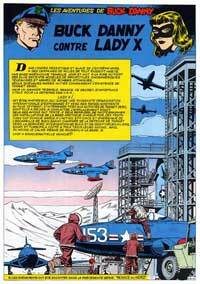 This kit remembers me to the old Buck Danny comic books of my youth and is a very nice addition to the collection. Highly recommended!